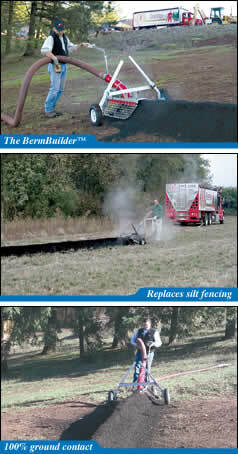 The Rexius EcoBerm® eliminates the need for plastic silt fencing. No matter what the terrain, the EcoBerm® can be installed with minimal effort as compared to silt fence or other methods requiring ditching and reinforcement. This tested and proven product* has revolutionized sediment control by providing an option that is not only earth friendly but proven highly effective. In a Certified Erosion Control testing facility, an EcoBerm® has shown to be over 99% effective in reducing soil loss. These test results show that EcoBerm® compares with the highest rated BMPs in the industry in similar conditions. EcoBerm® not only maintains a low cost for installation, but does not require removal or disposal and the expense associated with that extra process. The patent pending BermBuilder combined with a single step pneumatic application and Microblend additive creates a dependable system that insures the berm is installed to meet specified dimensions, and installed correctly with 100% ground contact. An independent lab* has shown that the combination of Microblend and the compost/mulch used to make EcoBerms® greatly enhances the ability of the material to degrade hydrocarbons as water flows through its three dimensional matrix. EcoBerm® uses no plastic materials in its construction. The fibrous matrix it forms with the help of the bonding capabilities of Microblend give the necessary structure needed without non-biodegradable reinforcements. Made with recycled organics, the compost/mulch blend can be used as an earth friendly soil amendment at the completion of a project. *EcoBerm®, the patent-pending BermBuilder, and Microblend were tested at San Diego State Universitys Soil Erosion Research Laboratory and shown to reduce soil loss by over 99% in tested conditions. An S.T.A. approved independent microbiology laboratory, BBC Laboratories of Tempe, AZ, tested and showed that Microblend greatly increased the hydrocarbon degradation capabilities of the compost/mulch materials used in EcoBerm®. Test results are available upon request. You must have the latest QuickTime plug-in. If you do not have the plug-in, you can download it here.